rec. Monastery Church, Mariannhill, Würzburg, Germany, 6-12 September 2013. DDD. * recorded in the presence of the composer. ** recorded from the original manuscript. The avowed intent of this recording is to highlight the qualities of the organ, a full specification of which is listed in the booklet; hence the very varied programme. I imagine that the sheer variety will put off some potential listeners – obviously an organ ideal for Bach is not quite as suitable for the nineteenth- and twentieth-century French masters – but it was one of the selling points of the CD for me. It’s clear from this recital that the Mariannhill organ is a versatile instrument. The booklet gives the details of how it was built after World War 2, restored in the 1980s and renovated and further expanded in 2011/2012 when a 32-foot pedal stop was added. Though the documentation includes the specification of the organ, I would have liked to have had the registration for each piece. The stops are what you would expect from a German organ but, though clearly no match for the Cavaillé-Coll sound that Jean Langlais would have heard at Sainte-Clotilde, where he was organiste titulaire, it’s not at all a bad match for his and the other French music. The first of these French works on the CD are Pierné’s Trois pieces. Though I have heard his orchestral and chamber works, I’m not aware of ever having come across his organ music before. In fact, though I enjoyed the music and performance enough to make me seek out more of his organ output, there is not much available apart from these three pieces, which are available on a number of alternative recordings, the only advantage of which would be that they mostly present the music in the company of other French composers, as on Bombarde! (Chandos CHAN9716) on which Ian Tracey recorded them along with Widor’s Organ Symphony No.6 and works by Boëllmann, Bonnet, Dubois and Gigout. I made another Ian Tracey recording of French Organ Music a Recording of the Month (Grandes Pièces Symphoniques, CHSA5056 – review) and I also enjoyed Bombarde! which I heard as a 24/44.1 download from theclassicalshop.net, where it’s also available in mp3 and 16-bit lossless formats, all with pdf booklet. The Pierné pieces usher in a central run of French or Franco-Belgian music on tracks 5-11, of which Alain’s paraphrase on the Te Deum and the Jongen Scherzetto are the most impressive. James O’Donnell recorded the Te Deum paraphrase as part of an all-Langlais programme from Westminster Cathedral (Hyperion Helios CDH55444 – Download News 2013/4) and whilst that remains a clear benchmark, even though the Helios series no longer comes at budget price, the new recording is impressive, too. (A few dealers may still have Helios CDs for around £6.50). I haven’t encountered Rudolf Müller before. This is billed as his debut with Priory and is, I believe, his first recording for any label. Just as the Mariannhill instrument lends itself well to a range of styles, he also shows sensitivity to the wide variety on offer here. The quality of the opening prelude and fugue, for example, makes me hope that someone will record him in an all-Bach programme, while Gardónyi’s Hommage à Liszt was recorded in the presence of the composer so it’s not unreasonable to assume that the performance is authoritative. 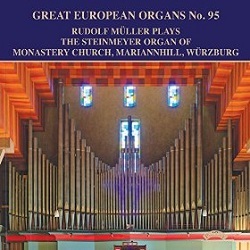 I’ve already reported that the organ is almost as well suited to the French as to the German repertoire and Müller, too, seems at home with both the organ, which he has known for ten years, and the varied programme. In the Langlais Te Deum paraphrase he is a little faster than O’Donnell but not to the detriment of the music. Max Reger’s Fantasia and Fugue on B-A-C-H is just the kind of work to end the programme and the combination of rip-roaring performance in the Fantasia and reposeful playing at the start of the Fugue, where the B-A-C-H theme is allowed to develop organically until it grows to the kind of pre-eminence which JSB holds for organ composers, is a tribute to both the organist and the Priory engineers. Like Mary Queen of Scots, whose motto was ‘My end is my beginning’ the end of this programme brings us back to the composer who for Reger was ‘the beginning and end of all music’, and with whom the recital began, in very satisfying fashion. With very good recording and Priory’s usual detailed documentation, this is a worthy successor to the many fine CDs in this series. Inspired by John France’s review, I also listened to No.93, from Riga Cathedral, as streamed from Qobuz (PRCD1111). He wondered if the fact that he had heard the Riga organ in the flesh and had a soft spot for it had coloured his recommendation. It hadn’t – and I thoroughly endorse his enthusiasm but you need the CD because Qobuz don’t provide any documentation.